"This is a Christmas delight! 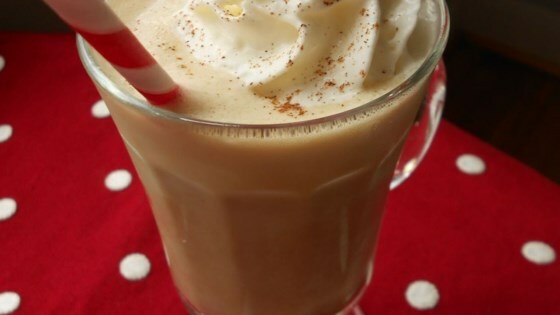 It's a quick and easy drink to serve to unexpected holiday guests." Scoop the ice cream into a pan over low heat. Stir in the eggnog and coffee; and heat until warm, about 3 minutes. Pour into four glass or ceramic mugs. Top each with 1 tablespoon whipped topping and sprinkle with nutmeg. Serve immediately. Great recipe, Ginger! This tastes just like Starbuck's Eggnog Latte! YUM! Will make again! I made this for a small group of 12 (doubling the recipe). It was extremely good and we all enjoyed a nice warm after dinner drink. This is the perfect after dinner coffee. It is festive and fun! I didn't change anything. this is a treat! didn't add the nutmeg or whipped topping- and still delicious. perfect for a christmastime brunch or pick-me-up! This a great drink. Tastes like one of those expensive drinks you would get at starbucks. I didn't care for it - too decadent & thick-tasting.